I love making my own watercolor sketchbooks and for at least a year have also been making by own book cloth using cotton fabric that I dye with Procion MX dyes and several suface design techniques. This is the sketchbook that I'm completing now. 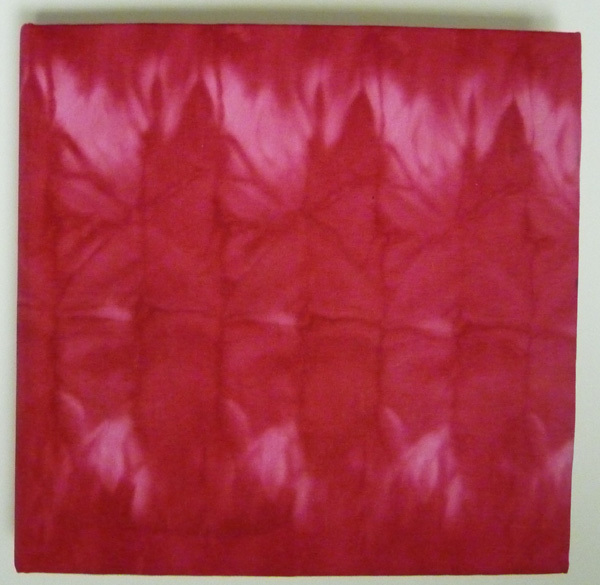 The cover was made by folding the fabric in different directions and then dipping it into the dye. This is the Sketchbook that I started yesterday - this time the cloth was stamped with tile spacers and corn dextrin resist before dying it. I use Canson Mi Tientes for endpapers in these sketchbooks - it is a wonderful weight paper and it comes in so many colors. The watercolor paper is Fabriano Artistico Extra-Bright 140 lb soft press paper - a nice compromise between hot and cold press for me. The books are approximately 7.5 inches square. 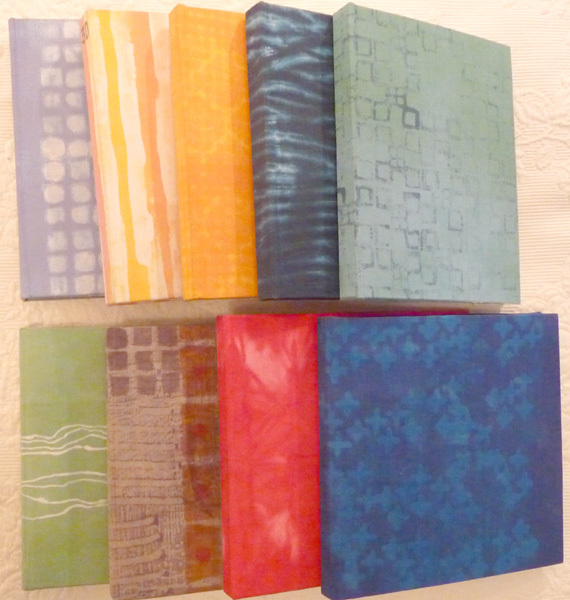 These are all of the sketchbooks that I made since I switched from black commercial bookcloth to hand dyed fabric fused to Thai mulberry paper. I fell in love with my first square journal and now seem to moving away from the 6 X 8" portrait size. Yesterday I took my grand daughter Sydney to the Natural History Museum since she had a day off from school. This little girl has NO interest in dinosaurs, so our visit consisted of the Butterfly Conservatory, African mammals (which she photographed in detail), Gems and Minerals, and the Rose Planetarium show called Journey to the Stars. 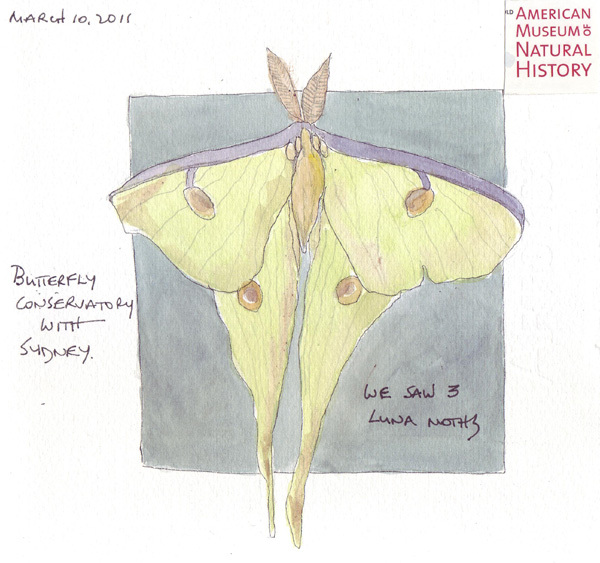 This week I was able to get a good photograph of the luna moth in the Butterfly Conservatory, so I painted him as the first entry in my new watercolor journal. I recently made a new sketchbook for a trip that I'm on. I meant to make the square and accidentally cut it into fourths instead, so I'm stuck with the smaller one. BUT...next time, I'm definitely going four square! Your books are beautiful. I'll post mine when I get a chance. Wonderful first page to your sketchbook! These are so beautiful! It's getting close to time to bind another book and I'm definitely going to try your approach to making your own bookc loth this time. I'd love to try a square book too, though I'd end up wasting paper since mine folds so nicely into a non-square format. Your sketchbooks look beautiful together! The journal covers are fantastic! The blue one is my favorite. Love the colors. You books are so "touchable". Enjoy. The butterfly is neat. You granddaughter is so lucky to have you take her to places that she likes. Your books are beautiful - and so individual, having your own cloth. I have never seen a moth like the one you have sketched and think he(?) will be a wonderful start to your new journal. These hand dyed fabrics are beautiful for book covers. I DO make my own bookcloth, but I have never used Procion dyes. 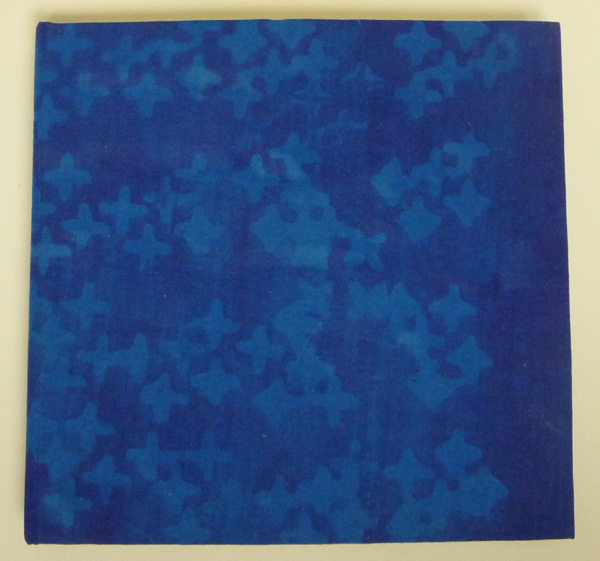 I did dye some cream silk with indigo, with shibori method once, but not enough to make a bookcloth. Hmm once you started this process it would be difficult to stop.